Sunday, October 15th 2017, starting at 10.00am. Leader: David Wormsley. Contact David on 07955 688017 or at meets@pdmhs.com. Meet in the pay & display car park in Castleton (next to the Tourist Information Centre) – Grid Reference SK149830. 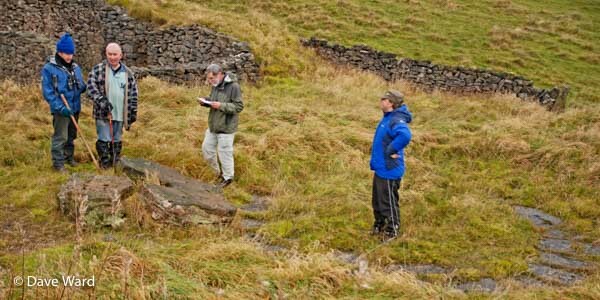 A free guided walk walk over 5 miles looking at some of the lead mining heritage of the area. This easy grade walk will start at 10.00am, and involve about 800ft of (fairly gentle) ascent in total. It is an all day walk, so do bring a packed lunch and a drink. The walk is open to all – not just PDMHS members – and no pre-booking is required. However, the walk is weather-dependent, so if you contact us in advance to register your interest, we can keep you informed of any changes or cancellation in the event of bad weather. You can contact us at meets@pdmhs.com or phone David on 07955 688017. Any changes due to weather conditions will also be posted on the website, so it is advisable to check back here before you set out. Leaving Castleton, we will first head to the bottom of Pin Dale to look at the 1870 winding and pumping engine house at Ashton’s Mine, along with other associated features (including a climbing shaft). We will then go up Pin Dale itself, looking at the Pindale Scrins with their impressive open-cuts on the way. Continuing on to Dirtlow Rake, we will pass the sites of numerous lead mines that once worked the vein, including Ashton Grove, Royse Grove and Kirk Grove. Many of these mines have impressive shafts (with large grills over them for safety), which we are hoping to view assuming we get permission from the landowner. There are also extensive open-cuts here, which are important for the numerous fossils and pick marks left by the miners. We will then visit the site of How Grove lead mine, which was the subject of a PDMHS conservation project between 1998 and 2000. The excavated features here include a well preserved horse-drawn crushing circle, and a rare circular buddle for sorting the ore. More information about Dirtlow Rake and the How Grove excavation in particular can be found here. From there, we will continue to follow Dirtlow Rake, passing the site of Hollandtwine Mine – though much of the lead mining heritage in this area has been destroyed by later reworking for fluorspar, barytes and calcite. There are still important remains to see at Hazard Mine, however, including a well preserved gin circle, and engine shaft. This is the highest point of the walk, and from there we will descend back to Castleton via Long Cliff – with a short detour possible to look at the mining remains near Hurdlow Barn if people wish to do so.